WOTOFO The Troll V2 RDA tank has deeper deck in 10mm to hold more juice. The Troll V2 RDA atomizer base is extremely compact with a dual-pole, four-hole design, which can support more cloud. WOTOFO The Troll V2 RDA tank has deeper deck in 10mm to hold more juice. The Troll V2 RDA atomizer base is extremely compact with a dual-pole, four-hole design, which can support more cloud. The base has three aprons, the atomizer can hold more cotton, store more oil, It is a veritable RDA atomizer. Tight structure, no leakage phenomenon. WOTOFO The Troll V2 RDA is the gospel of the vast number of DIY fans. Original WOTOFO The Troll V2 RDA, i had order a fake from other store, so i am so happy it is 100% original. It has two post build deck , 2.7mm wire holes,huge vapor. Perfect. Very beautiful gift. I like the design for the box. The rda comes with 3pcs pre-made twisted coil. You also can use bigger coil then it can hold more e-juice, quality good. 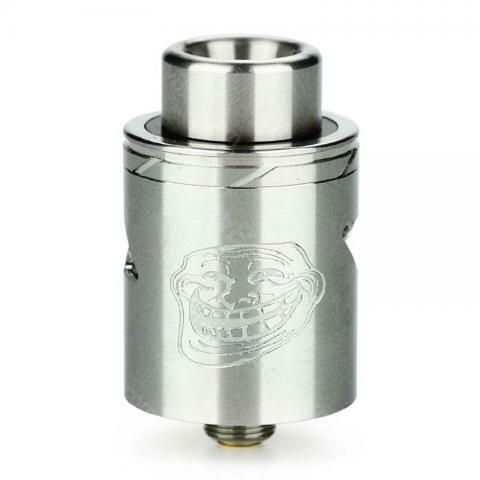 WOTOFO The Troll V2 RDA is quite easy to build coils with. Ich benutze WOTOFO The Troll jetzt seit zirka zwei Wochen und es ist weder etwas ausgelaufen, noch geht der Akku so schnell leer.